The rough environmental conditions and loads are a real challenge for every component of the wave energy converter. We develop unique and high performance solutions where technology standards are not sufficient. To be quick and efficient, the development always includes functionality and performance tests with scaled model components before building large scaled ones. The comprehensive in-house engineering and testing is supported by a broad network of research and business partners. Raue Offshore-Umgebungsbedingungen in Kombination mit hohen Effektivitätsanforderungen sind die ausschlaggebenen Faktoren für die Entwicklung innovativer Komponenten. Wir entwerfen und optimieren Lösungen, wo Standard-Technologien nicht ausreichen. 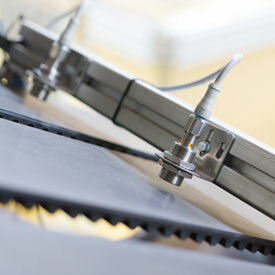 The NEMOS spring is a high-tech component that allows efficient energy buffering and pre-tensioning. Its lightweight composite construction, capable of high torsion loads, can improve performance in other industrial applications, too. To monitor and evaluate developed systems and components various sensors are essential. To seamlessly integrate reliable sensor technology into hardware setup and monitoring software, we design tailor-made solutions that fit perfectly to our customers` needs. The development of robust control software is key to reliable system operation. We develop customized automation software for various applications such as lean test bench setups, cable robots and fully automated remote wave energy converters. 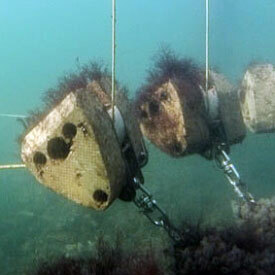 The NEMOS underwater pulley systems are designed for high efficiencies in combination with belts or ropes. Optimized sheave geometry and hinge designs allow varying feed angles. Application-specific bearings are procured in close cooperation with our partners.